Imagine watching a video every time you grab a beer from the fridge, and I am not referring to watching a video on your mobile devices, I am referring to watching a video on the fridge! 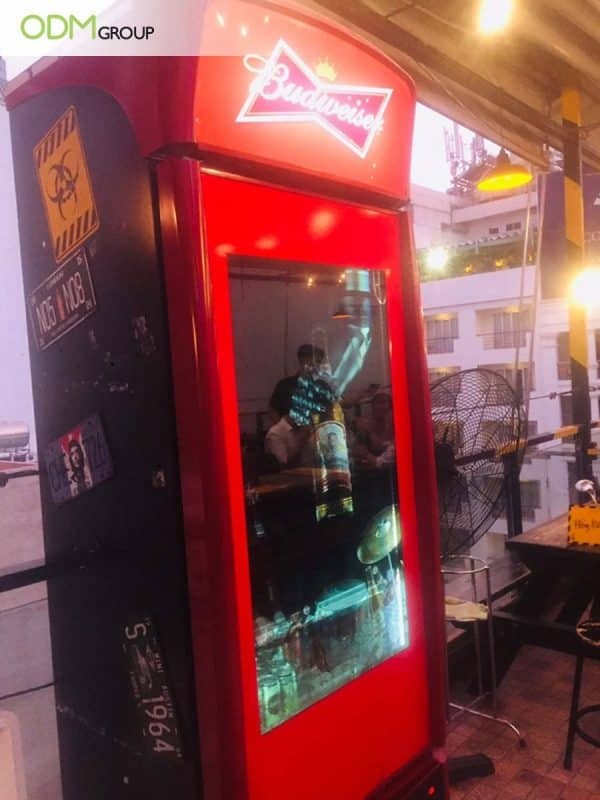 Budweiser incorporated this futuristic idea into their custom display fridge, and here is why you should too! Normally when we think of fridge displays, we envision boring clear sheets which allow us to clearly see what is inside the fridge. Sure it does its job, but compare it with the videos on Budweiser’s Custom Display Fridge. An aesthetic display will not only attract the attention of passing by customers but will also increase the odds of purchase as compared to a dull display. It is crucial that displays not only attract the attention of customers but also hold on to them. The video marketing on the custom display fridge certainly attracts and holds attention. It is also important to note that videos should be simple and customer friendly such that customers understand the message. This concept is also similar with POS Video Displays. Video displays are extremely useful in pricking curiosity and attracting attention. This will definitely boost brand awareness as customers would take time off their day to learn more about the brand. The innovativeness and uniqueness of a custom liquor display will also increase word-of-mouth marketing for the brand. With increasing positive remarks spreading, the brand will enjoy a rise in sales. This will also see an increase in new customers as the brand is linked to good marketing. Video displays are highly customisable! There are no limits as to how you should create your promotional video. The theme of the video can be informative or absolutely random, and it will still attract audiences. You will also be able to customise the colours, size, and message. Thus you can better showcase your brand to potential customers. A creative retail display idea will not only attract and retain attention from passersby but will also be the talk of the town. Video displays on custom display fridge are not only innovative but also provide a breath of fresh air from the conventional transparent doors. Not only are they aesthetic, but also provide high utility value. When done right custom display fridges will definitely boost brand awareness and sales. Looking for POS video displays or video marketing units for your products to boost sales? Fortunately, the ODM team can help you come up with inventive and unique in store displays. We have product designers who have vast experience in designing custom in store displays for your business. Contact our team today to learn more about how we can help you grow your business through the use of effective promotional products! Interested in Video Display Marketing? Need examples of in-store video pos displays? Here’s what Esseno did! Why limit yourself to video displays? Why not consider custom frames too! Here’s what Guinness did! Have trade shows up next? Here are some marketing ideas for Cosmetic Video POS Displays! Are Custom Display Fridges too big for your liking? Prefer something more mobile? What about a gift box? Video displays can also be done on Point of Sale Displays too! Here’s what Mightmug did to increase visual impact!